Head coach Robbie Neilson played down the significance of Hearts' win over Rangers that sent them nine points clear in the Championship title race. Jason Holt's strike and Jamie Walker's penalty secured the win at Tynecastle, after Steven Smith was sent off for the second-placed Ibrox outfit. 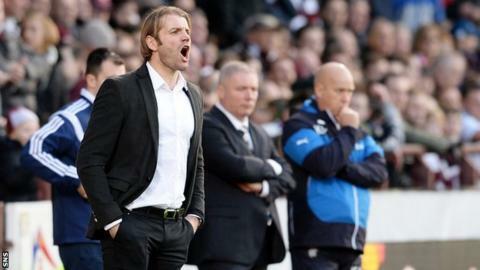 "It's massive for the confidence but not in terms of having a huge bearing on the league," said Neilson. "We need to continue doing the right things." And he added: "We can't think 'we're nine points clear so we can take our foot off the gas'. We need to keep moving and keep working hard." Smith saw red in the first half for a lunge on Callum Paterson and Neilson, whose side remain unbeaten in the league, admitted the dismissal was a key moment. "The game hinged on the sending off," he told BBC Scotland. "Before that, Rangers had the upper hand, they kept us penned in and we couldn't get through them. The sending off changed the game and thankfully it changed it in our favour. "There were quite a few meaty challenges from both sides and the referee made his decision on that one, I haven't seen it yet to be honest. "Rangers are a good team, there's no denying that. They've got good players, guys who know the game and probably venues like this suit them, where it's an intense atmosphere and they can handle it. They were the better team until the sending off. "Thankfully we got Jason's goal. It came off a decent move and then a wee bit of luck as it broke at the edge of the box. I always know when it falls to Jason in that area there's a good chance he's going to score it." Neilson has overseen a sensational start to the season for Hearts, but he passed on the plaudits. "The key has been the players, their work-rate, embracing the training regime and their commitment to doing the right things and working hard," he said. "The training regime here has changed quite dramatically in that they do a lot of extra sessions and extra hours. There's been no complaints at all. It would have been easy for them to say 'this isn't the way it's done, this is the way we've always done it,' but they haven't. "The players have been magnificent and I couldn't ask any more from them."